Fort Anne is Canada's oldest national historic site. It was declared a Dominion (federal) park in 1917. 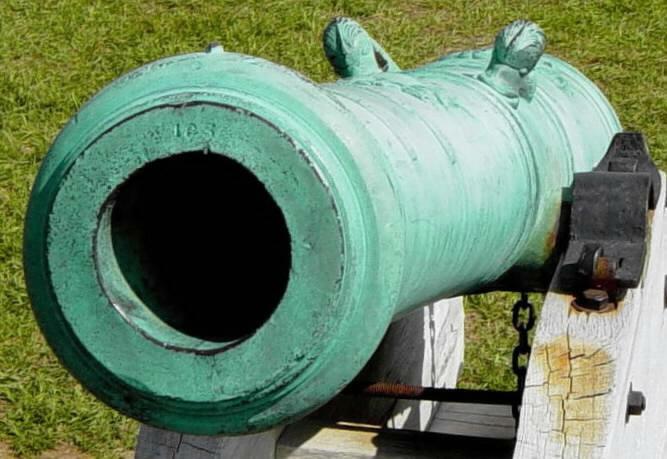 This cannon is named LA RUGISSANT, "The Roaring One". Many guns were personalized with names cast in raised letters on the gun. Castillo de San Marcos in St. Augustine, Florida, has a 4-pounder "San Marcos,"
and, indeed, saints' names were not uncommon on Spanish ordnance. El Toro (The Bull), and El Belicoso (The Quarrelsome One). widely used on European ordinance during this age of royal absolutism. 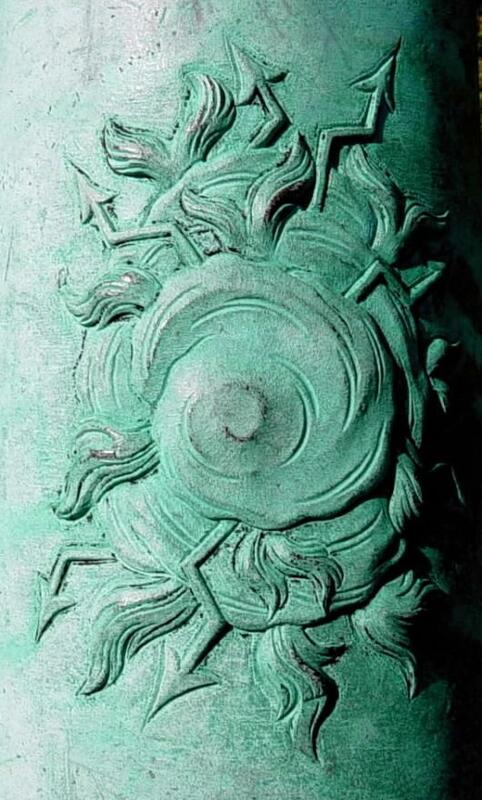 The decorative lifting handles were often cast in the shape of stylized dolphins. The centerline of the trunnions was placed slightly ahead of the center of gravity of the gun. The handles were placed so that the lifting point was slightly behind the trunnion centerline. The first reinforce bears the famous device of the "Sun King"
with his motto, NEC PLURIBUS IMPAR. describing himself as a match for any number of adversaries. Tha above photographs were taken on 13 June 2003. 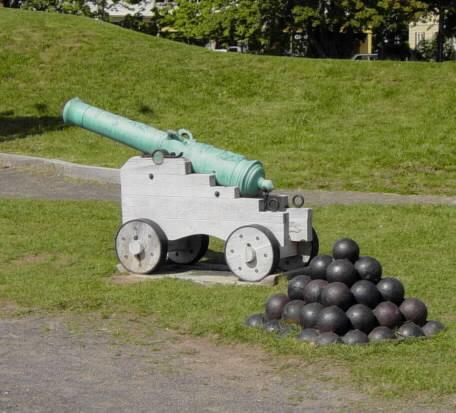 18th and 19th century artillery. Often mistakenly called brass. and not suitable for ordnance. and definitely suitable for ordnance. mixed and melted together, is called an alloy. Any alloy, or mixture, of copper and tin is called bronze. Many bronze alloys also contain small amounts of other materials. used for shields, helmets, and battle axes. 4000 years ago the Chinese made early coins of bronze. bronze was preferred aboard ship or in seacoast forts. elements added to produce special characteristics. incorrect, or by modern writers who don't know the difference. references the term used is brass. Bronze is almost never mentioned. which would make it bronze according to a modern definition..."
The only brass guns were those made by the uninformed. strongest of the various bronze alloys.